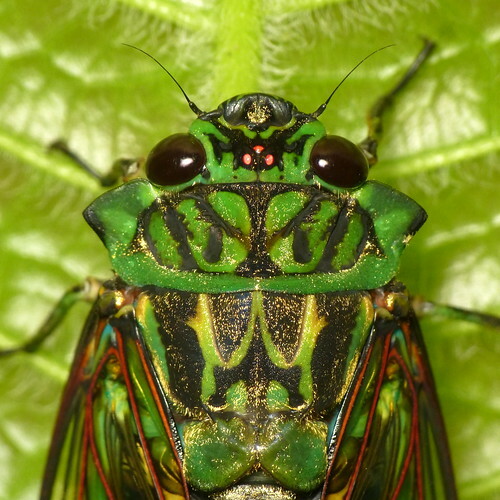 Most of the information on this website is focused on cicadas of the U.S.A. and Canada. There are plenty of cicadas south of the U.S., of course. Recently we started getting identification (ID) requests for cicadas of Mexico, and with the help of experts (Geert Goemans and Allen Sanborn) and a paper from the early 20th century, I was able to ID them all. A large number of the IDs were for cicadas with pronounced pronotal collars. Many of these look like the same species, but they’re not. Many of these species are found from Mexico, throughout Central America down to South America. On this page are six collared cicadas that exist in Mexico, Central America and South America. Illustrations come from Insecta. Rhynchota. Hemiptera-Homoptera. Vol. I by W. L. Distant and The Rev Canon W. W. Fowler, F.L.S. I updated the names to their current names (the source is about 100 years behind the times, expectedly so). Note that the illustrations from this document are of dead specimens, so the colors were faded at the time they were illustrated. Formerly Odopoea montezuma. This cicada is actually tourquois to pale blue when alive. Red eyes. No infuscation (coloration) in the wings. Link to original illustration..
Green with black infuscation in the wings. Green with remarkable black infuscation in the wings. Goemans, Geert. (2010). A historical overview of the classification of the Neotropical tribe Zammarini (Hemiptera, Cicadidae) with a key to genera. ZooKeys. 43. 10.3897/zookeys.43.386. This flicker gallery of cicadas with collars. I think Geert curates this. A recent, related article by Allen: Allen F. Sanborn. 2018. The cicada genus Procollina Metcalf, 1952 (Hemiptera: Cicadidae): Redescription including fourteen new species, with a key to the species of the subtribe Dazina Kato, 1932 rev. stat., the description of the Aragualnini n. tribe, and one new combination. Zootaxa 4389(1):1. 10.11646/zootaxa.4389.1.1.